Play for Free Money in the PokerNews-Exclusive $5,000 Freeroll on Full Tilt! Everyone is feeling a little light in the wallet after the Holidays. With that in mind, would you like to add some money to your poker account without having any risk to your bank account? Here's some exciting news for you! 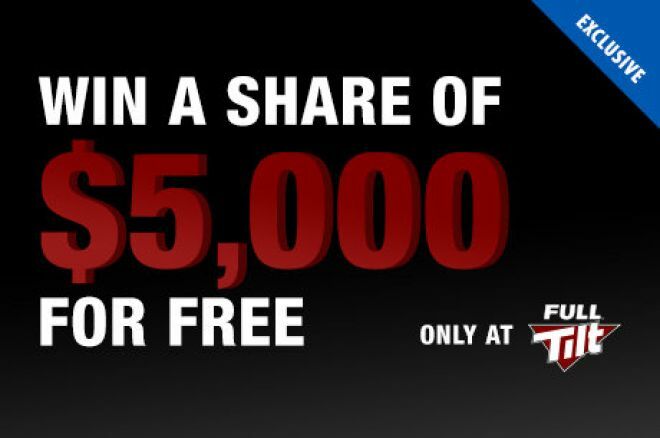 Our friends at Full Tilt are giving you a chance to start your 2015 poker record in the right direction with a huge $5,000 PokerNews-exclusive freeroll on February 6, 2015 at 2 p.m. ET! Remember, this tournament is only open to our PokerNews readers, so your chances of taking down a big prize in the small field are good. If a piece of $5,000 for free sounds like a good way to start your year, just follow the easy instructions below to play in the hottest freeroll on Full Tilt! If you do not already have a Full Tilt account, your path to earning a ticket to this PokerNews-exclusive event is very easy. Simply download Full Tilt through PokerNews Canada, make a deposit before January 31, and you will instantly be rewarded with a free ticket to play for a share of $5,000 on February 6! If you're feeling left out because you already have a Full Tilt account, don't worry; we didn't forget about you. If you created your account through PokerNews, you can also qualify to participate. Your path is just as simple. Just generate 200 FTPs from January 1 to January 31 and you will automatically receive a ticket to join the others at a chance for a big payday! While 200 FTPs may sound like a large number, it really isn't, since this equates to only $20, or less than $1 of rake per day in most countries! The PokerNews-exclusive $5K Freeroll is only available to players that have signed up to Full Tilt through our links. What this means to you is that the field size will be much smaller than you may be imagining! A smaller player pool means you have a great chance of earning a few bucks or even hitting it big by winning the top prize! So don't find yourself on the sidelines while others are after free money that could be yours! Download Full Tilt through our links today and get your seat to the $5,000 freeroll! To get more details about this promotion or to see how to register to the PokerNews-exclusive freeroll scheduled for Feb. 6, have a look at this page. Fill Your Stockings With a Free Share of $10,000 at Full Tilt!